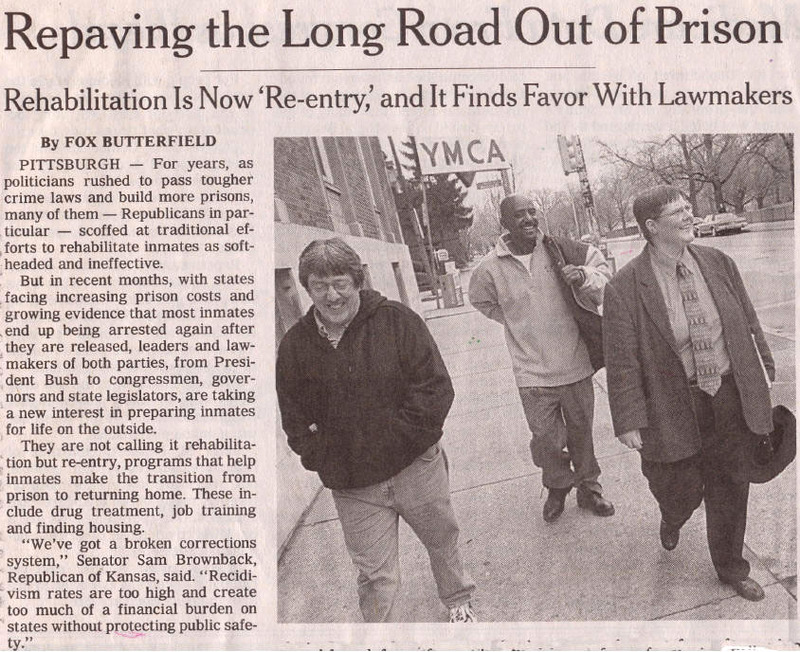 Repaving the Long Road Out of Prison. (National Desk) Fox Butterfield. For years, as politicians rushed to pass tougher crime laws and build more prisons, many of them -- Republicans in particular -- scoffed at traditional efforts to rehabilitate inmates as soft-headed and ineffective. But in recent months, with states facing increasing prison costs and growing evidence that most inmates end up being arrested again after they are released, leaders and lawmakers of both parties, from President Bush to congressmen, governors and state legislators, are taking a new interest in preparing inmates for life on the outside. They are not calling it rehabilitation but re-entry, programs that help inmates make the transition from prison to returning home. These include drug treatment, job training and finding housing. ''We've got a broken corrections system,'' Senator Sam Brownback, Republican of Kansas, said. ''Recidivism rates are too high and create too much of a financial burden on states without protecting public safety.'' The problem, Mr. Brownback said, is that the public went too far in its desire to get tough on crime, and scrapped much of what was known as rehabilitation. What people forgot, he said, is that 97 percent of the nation's inmates eventually are released and have to go somewhere. Kevin Cruse, left, and George Caldwell, second from left, are former inmates enrolled in an Allegheny County Department of Human Services program. Karen Dickman, in tie, is a coordinator in the program, which found the men YMCA housing. Sixty-seven percent of the 630,000 state and federal prison inmates who will be released this year are likely to be rearrested within three years, according to the federal Bureau of Justice Statistics. Nine million people are released from jails annually. In his State of the Union address, Mr. Bush proposed a $300 million initiative for re-entry programs, to be conducted by religion-based groups. In addition, the National Governors Association has created a Prisoner Re-entry Policy Academy, putting on workshops in seven states to improve the process. Similarly, the Council of State Governments has formed a Re-entry Policy Council, working with 100 experts, to come up with a manual. The report will contain recommendations on how states can better help newly released prisoners find jobs, get decent places to live and re-establish relationships. At the same time, the National Institute of Corrections, a branch of the federal Bureau of Prisons, has developed a new model for re-entry that it is trying to use in nine states. Mr. Brownback says he plans to introduce legislation this spring, with bipartisan support, to try to overhaul the corrections system. It will call for reducing recidivism from 67 percent to something closer to 20 percent, a revolutionary goal. Although restoring rehabilitative programs has long been a goal of liberals, Mr. Brownback sees this differently. ''I think this can be a classic compassionate-conservative issue,'' he said, if religion-based groups get involved in the job training, mentoring and drug treatment. Nowhere has the effort to improve the re-entry process been more successful, and had more bipartisan support, than here in Pittsburgh, in Allegheny County. One program, sponsored by the Allegheny County Department of Human Services for offenders with mental illness coming out of Pennsylvania prisons, has reduced recidivism to only 9.9 percent. Jean Hull, a former state-prison inmate who had a diagnosis of manic depression, served her full two-year sentence for resisting arrest without even applying for parole because her illness left her too afraid to face the outside world. Under Pennsylvania law, Ms. Hull, 38, would simply have been released on her own, with no further supervision or help beyond a bus ticket to nowhere, were it not for for the Allegheny County program. The program, for both county jail and state prison inmates with mental illness, arranged to have Ms. Hull picked up at the Pittsburgh bus station and then bought her clothes, found her housing and made sure she had her medications. ''Without the program, I would have ended up back in prison, or on drugs, or dead,'' she said. The State Senate Budget and Finance Committee recently recommended that the program serve as a model in the state as a way to save money. State Senator Jane Clare Orie, a Republican and a former prosecutor, was one supporter. The Pittsburgh program tries to help some of the most troubled inmates, those with not only mental illness but also drug addiction, homelessness and often multiple earlier prison terms, putting them at high risk of re-arrest. It began as a result of a consent decree, because of chronic overcrowding in the Allegheny County jail and the lack of treatment for inmates with mental illness. But its founder, Amy Kroll, the director of forensic services for the Allegheny County Department of Human Services, turned it into a comprehensive program for mentally ill offenders that now includes a mental health court, a drug court and a re-entry component as well as the part that helps state prison inmates. Ms. Kroll, a former prison guard and a police emergency psychiatric clinician, requires her staff of 26 to go to jails and prisons and get to know each inmate well before the inmate is released. ''We try to be detectives, to find out everything about a person,'' Ms. Kroll said. Each time a person is released, Ms. Kroll or a staff member is waiting. The staff member takes the released prisoner to a Kmart and provides $200 to buy clothes and other necessities, like toothpaste. Next it is off to the medical assistance office. The staff has already done the paperwork to make sure that the offenders' psychiatric medications will be ready. Most mentally ill people released from prison have no supply of pills and often must wait weeks before getting their medications, often leading to a relapse. From there Ms. Kroll's staff takes the newly released to the Social Security office, to apply for supplementary Social Security benefits because of their illness. Then they go to prearranged housing. They are also given bus passes. The average cost is $3,000 a person, well below the national average of $25,000 a year for a prison inmate, Ms. Kroll said. The money comes from the county, the state and several foundations. One of Ms. Kroll's first inmates was Ronald Williams, who suffered from paranoid schizophrenia. He had been in the county jail for a year, convicted of stalking. At the time of his arrest, Mr. Williams had also been homeless for six years. But Ms. Kroll kept visiting him in jail, getting to know him, and took him to Kmart on his release. Mr. Williams, 64, is doing so well that he rents his own apartment and manages a gypsy-cab company. Amy Kroll, creator of the Allegheny re-entry program for prisoners, spent time with her daughter and another former inmate, Ronald Williams.